God, I hate so-called “magic realism”. In books, at any rate. I don’t get along with Gabriel Garcia Marques, or Isabel Allende, or any of that lot. 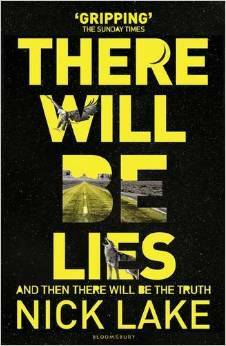 So a bit of the way into There Will Be Lies (And Then There Will Be The Truth) by Nick Lake, my heart sank a little when it became clear that a large part of the story would involve the protagonist, 17 year-old Shelby, and her relationship with a fantasy coyote creature who protects her, warns her and leads her into unimaginable danger. At this point I would normally have sighed and picked up something else. Trouble is, Nick Lake is my editor at HarperCollins and had the immense good sense and taste to get HarperCollins to buy my book Time Travelling With A Hamster (Spring 2016) He’s read mine; I should at least read his. And it’s brilliant! Phew. Shelby has grown up in Arizona, home-schooled by her uber-potective mum and, despite sounding like a typical, worldly American teenager, is woefully ill-prepared for the world. After she is hit by a car and breaks her leg, she and her mum begin a road trip during which a shape-shifting Coyote turns up in the guise of the handsome Mark offering advice and warning Shelby that all is not as it seems in her life. She will be lied to – but how and by whom? There are some terrific twists in the plot, and Shelby’s voice is unique and utterly plausible. It’s hard to believe that the book was written by a middle-aged Englishman and not a whip-smart US teen. The magic realism is perhaps better described as “fabulism” for it draws heavily on Native American myths which reminded me of the Australian Aboriginal timelessness they call “Dreamtime”, and it’s so deftly handled, and greeted with such scepticism by Shelby, that it slips down without any of the prickles of irritation that I normally experience with this form of story. PS It has just occurred to me. Is time travel “magic realism”? I guess it is, in a way. In which case I have just written a book in a genre I thought i hated. Huh. This entry was posted on June 1, 2015 at 3:53 pm and is filed under books, Review. You can follow any responses to this entry through the RSS 2.0 feed. You can leave a response, or trackback from your own site.